So, a week later a hesitant Seamus and I donned our Sunday best and went to meet our photographer Lauren. It was a lovely opportunity for us both to meet her properly and a chance to get all the nervous giggles out of the way just in time for our big day. We decided to go to Lurgan park as it’s a place we like to go for a nice walk when we have a rare day off. It was a bright and brisk winters day and much to Seamus's original opinion, it was actually a really fun day full of laughter and craic. In fact, the ironic thing about it was that I was actually the more awkward and nervous one whilst Seamus had managed to channel his inner Brad Pitt and ended up being a total natural in front of the lens. The real reason that I wanted to document our engagement apart from the obvious reason that it was an exciting time in our lives that I wanted to be captured was that I just simply adore photographs. I am really sentimental and love hearing old stories about our family and their lives and over the years I have gathered all my families precious photographs and have them in a big trunk. When my Granny Theresa or T.T as we liked to call her passed away my Granda gave me a little brown case and inside it was filled with the most amazing collection of photographs which spanned nearly a century. I often take the little dusty case out and spend hours going through all the old pictures. My granny had very cleverly put dates and places on some of the pictures, (something that I really should do myself for my future grandchildren) so that we knew where she was and when. I just love the smell and feel of the pictures and of course, the style was amazing. I find myself constantly trying to imagine what life was like back then. 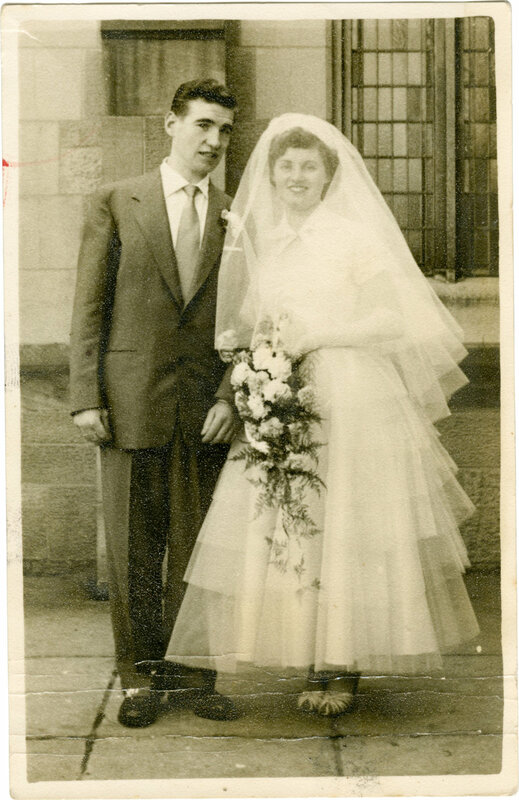 What were my parents and grandparent's dreams and aspirations as they started off their married life? One of my biggest fears is that our generation is going to lose so many precious memories as we do not print off photographs the way we used too. Yes, we might have instant access and more ways to take beautiful photos but where will they be in 50 years. Facebook and Instagram will have been replaced by some new app or invention and with that, our photographs will be gone. So, my New Years resolution this year is to start printing off my photos or making photobooks. Hard drives will die and phones will break so I am adamant that I will safeguard our families history buy starting to PRINT PICTURES! As a young child I can remember looking at a portrait of my granny Theresa which hung proudly on her wall. She told me that she had got it taken to mark her 18 birthday. With her bright smile and tight curls she looked like a film star, it was so simple yet elegant and when you looked into her twinkling eyes you could see she had her whole life ahead of her with dreams yet to unfold. Looking at our engagement photos we do not know either, what life has in store for us but we are ready with open arms to see what our future holds and I can only wish that someday a young girl will be looking at our picture saying "look at Granny Ash and Granda Shay, I wonder what they were like at my age!"